The TOEFL (Test of English as a Foreign Language) and the TOEIC (Test of English for International Communication) are similar exams. They both test one’s English level, and they are both multiple choice tests (at least in part). However, there are a few important differences. The TOEFL is Internet-based, which means you take it on a computer. The TOEFL has four sections, two of which are multiple choice (Reading and Listening) and two of which are student-generated response (Speaking and Writing). The TOEIC, on the other hand, is paper-based, and it is completely multiple-choice. It has two sections, Listening and Reading. While there are no speaking or writing sections –a separate TOEIC test exists for these – the Listening section has more distinct question types, and there is more grammar tested in this Reading section than there is on the Reading section of TOEFL. Finally, TOEFL is more school and university based, and the TOEIC is more everyday business based. The texts and dialogues (and the speaking and listening on TOEFL) reflect these differences. Do I need to take the TOEFL or the TOEIC? Which one? If you are planning to study in the USA and aren’t a native-English speaker from an English-speaking country, you will most certainly need to take the TOEFL. 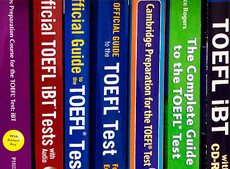 Some European programs do not require the TOEFL or require an alternative exam (such as IELTS). The TOEIC can be an alternative exam in some programs (such as certain MBAs). Some programs also waive the exam if you earned a degree in an English-speaking country. Check the university’s admissions requirements for foreign students. You should definitely prepare for it, whether you choose to study on your own or take a course. It is essential that you be familiar with the exam you will take, before you take it. You may not need to take a course to get the score you need, and in the case of these two exams you may not need a complete course at all. A lot depends on your English level and fluency. Classes are one-to-one, though it is possible to form groups if there is enough demand. We do a complete review of the exam, focusing primarily on the Speaking and Writing sections.